Schomacher, J. et al., Manual Therapy (2015), http://dx.doi.org/10.1016/j.math.2015.04.010. Exercise has been shown to be an effective treatment for people with chronic neck pain but the neuromuscular changes in response to training are typically specific to the mode of exercise performed (Miller et al., 2010; Jull et al., 2008; Falla et al., 2012). Patients with neck pain often display increased sternocleidomastoid activity and decreased deep cervical flexor activation (Jull et al., 2009). Therefore, exercises to increase deep cervical flexors activity are often employed (Falla et al., 2004; O’Leary et al., 2011b). It has also been shown that the deep cervical extensor, semispinalis cervicis, is relatively inactive in individuals with chronic neck pain while showing increased activation of the superficial extensor muscles including the splenius capitis (Schomacher et al., 2012b, 2013; Schomacher and Falla, 2013). This study attempted to demonstrate a method to activate the deep cervical extensor muscle, semispinalis cervicis, while relatively inhibiting the superficial cervical extensor, splenius capitis, as is done with deep cervical flexor exercises. Resistance applied in either flexion or extension at the occiput, at the level of the vertebral arch of C1 and of C4. Maintaining the neck in neutral while inclined prone on the elbows, with and without resistance at C4. The ratio between semispinalis cervicis and the splenius capitis EMG amplitude was quantified as an indication of whether the exercise could emphasize the activation of the semispinalis cervicis muscle relative to the splenius capitis. Manual resistance applied in extension over the vertebral arch emphasized the activation of the semispinalis cervicis relative to the splenius capitis at the spinal level directly caudal to the site of resistance (ratio: 2.0 ± 1.1 measured at C5 with resistance at C4 and 2.1 ± 1.2 measured at C2 with resistance at C1). Ten healthy volunteers (3 men and 7 women; age 30.7+/-7.4 years; height 170+/- 8.8 cm; weight 67.6+/-24.8 kg) without neck pain participated. Intramuscular EMG, guided by ultrasound, was acquired from the semispinalis cervicis and splenius capitis muscles at the level of the 2nd and 5th spinous processes on the right side. The subjects were placed in a prone position with the head slightly flexed. The deep cervical artery, which lies in the fascia separating the semispinalis cervicis from the splenius capitis muscle, was visualized with Doppler sonography prior to the insertion of the needle. The needle was inserted at the spinal levels of C2 and C5 vertically into the semispinalis cervicis and at a 45 degree angle into the splenius capitis. Once the target muscles were identified by ultrasound, the needle was removed leaving the wire in the muscle belly for the duration of the experiment. A reference surface electrode for each wire was placed adjacently (mastoid process, spinous process C7, and for the levels of C2 and C5) and a further common reference electrode was placed around the wrist. The participants were then seated in a device to measure neck muscle force (Cervical-Multi unit, BTE technologies, USA). Three maximum voluntary neck extension contractions were measured and the highest value of force was selected as the maximal force. The subjects then performed isometric exercises against manual resistance in sitting resisting axial traction and compression (Figures 7, 8), extension and flexion (Figures 1-4), and standing in front of a table propped up on both forearms in extension (Figures 5, 6). Each exercise was repeated twice for approximately 10 seconds during which EMG activity was recorded. The intensity of the resistance was applied with the maximal force that each subject could counteract without discomfort from the investigators hands/fingers over the neck. Manual resistance could not be standardized so the ratio between normalized root mean square (RMS – estimated amplitude of the EMG signal) of the semispinalis cervicis and splenius capitis was calculated and compared across conditions. 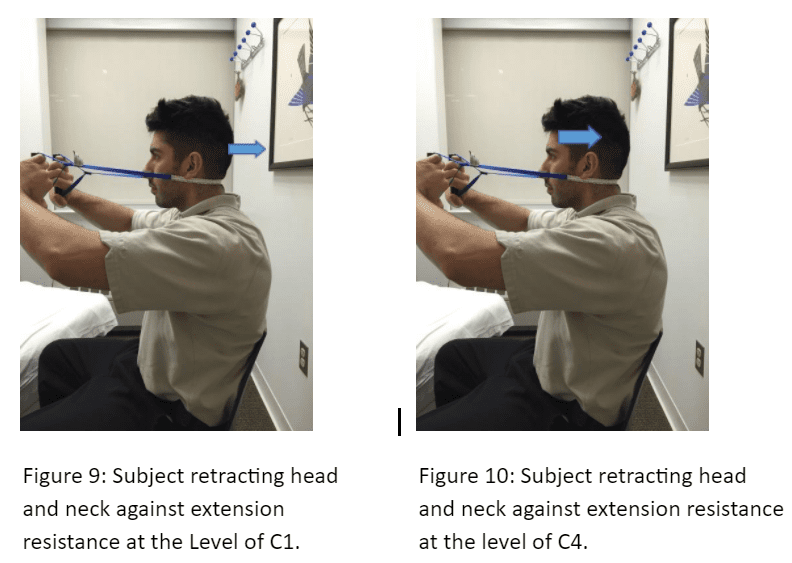 Figure 2: Subject retracts head and neck against the extension resistance at C1. Figure 3: Subject protracts head against the flexion resistance at the occiput. Fig 5: Propping on elbows with head aligned. Figure 6: Propping on elbows with resistance in extension at the level of C4. Figures 7-8: Compression and traction respectively while asking the patient to resist the downward or push upwards. A three-way ANOVA (Analysis of Variance) was conducted on the normalized RMS values for semispinalis cervicis and splenius capitis, both at C2 and C5, with direction (flexion and extension), location of resistance (occiput, C1 and C4) and muscle (semispinalis cervicis and splenius capitis) as factors. This study evaluated and confirmed, for the first time, the ability to enhance the activation of the semispinalis cervicis muscle relative to the splenius capitis at different spinal levels with targeted exercise interventions. The activation of both muscles at both spinal levels was greatest when resistance was applied to the head, for flexion and extension, compared to resistance over the vertebral arches. Resistance at C1 produced higher muscle activity at C2 compared to resistance at C4 which has no direct lever at the level of C2. Resistance at C1 had the same level of muscle activity at C2 as it did at C5 indicating the other factors influence muscle activation. The ratio between the semispinalis cervicis and splenius capitis recorded at C2 was highest when resistance was applied in extension at the level of C1 compared to resistance applied at the occiput or the level of C4. The ratio of muscle activity at C5 was highest with resistance in extension at C4 compared to the occiput or C1. Manual resistance applied over the vertebral arch can emphasize the activation of the semispinalis cervicis relative to the splenius capitis directly caudal to the location of the resistance compared to resistance applied at other locations. These concepts might be clinically relevant when movement dysfunction or structural changes are identified at specific segments. The aim of this exercise was to emphasize the lower cervical extensor muscles, so resistance was only applied at C4. This may be helpful for patients presenting with a forward head posture. As previously confirmed, resistance over the vertebral arch of C4 further increased the activity of both muscles at both levels but more so at C5 compared to C2. The ratio between the deep and superficial muscles did not differ with this exercise, however the muscle activity recorded at C5 was higher compared to the exercises when the resistance was applied in flexion which suggests that extension on elbows is still an effective way to activate the semispinalis cervicis in the lower cervical spine. Higher muscle activity was recorded for both muscles at both levels during traction versus compression. Cervical lordosis flattened during traction and increased during compression. Flattening of the cervical lordosis occurs during traction (Panjabi et al., 1978) which may prompt activation of all extensor muscles. Compression tends to increase cervical lordosis which cannot be limited by extensor muscle contraction. The activation of both the semispinalis cervicis and splenius capitis during compression may reflect coactivation with the cervical flexor muscles which are likely more activated (Falla et al., 2007b). The invasive nature of the experiment limited the sample size of the study but it is consistent with other invasive EMG studies. The electrode wires may have moved during the exercise because the size of the wire and the inability to confirm its location once the needle was removed. The hook at the end of the wire did limit its movement. Pressure on the tissue near the wires may have caused EMG artifact but this was monitored continuously throughout the experiment. The validity and reliability of the exercises selected have not been previously evaluated. Both muscles were activated in all of the exercises. Exclusive activation of the semispinalis cervicis was not found, however resistance applied over the vertebral arch did activate the semispinalis cervicis relative to the splenius capitis directly caudal to the site of resistance. The study was performed on pain-free subjects and the results may differ if performed on subjects with neck pain however previous studies have concluded a difference in semispinalis cervicis relative to splenius capitis in people with chronic neck pain when resistance was applied locally to the neck. Since resistance applied over the vertebral arch was found to activate the semispinalis cervicis relative to the splenius capitis directly caudal to the site where the resistance was applied, this concept may prove to be useful if applied to people with neck pain who have shown to suffer from impairment to this muscle during clinical testing. What do we know about the semispinalis cervicis? The fibers of semispinalis cervicis originate from the transverse processes of T1 to T5/T6 and insert on the spinous processes of C2 to C5 (Leonhard et al., 2003) respectively down to C7 (Schünke et al., 2006; Drake et al., 2010). The deep semispinalis cervicis muscle is active predominately in extension with a small ipsilateral component (Schomacher et al., 2012b). The activity of the semispinalis cervicis increases with increasing contraction intensity (Schomacher et al., 2012b), confirming observations for other neck muscles, such as the sternocleidomastoid, semispinalis capitis, splenius capitis and upper trapezius (Blouin et al., 2007; Falla et al., 2010; Lindstrøm et al., 2011). This finding suggests that multiple muscles can be recruited at lower loads to generate a required force in a desired direction, while at higher loads the primary muscles are predominately recruited (Blouin et al., 2007). Schomacher and Falla, in 2013, found structural changes in the deep cervical extensors of patients with neck pain compared to healthy controls such as a higher concentration of fat within the muscle, variable cross-sectional area and higher proportions of type II fibers. They postulated that these findings suggest that the behavior of the deep extensors may be altered in patients with neck pain. On the contrary, fatty infiltration of muscle tissue has not been observed consistently in patients with insidious-onset neck pain (Elliott et al., 2008b). The superficial cervical extensors typically show increased activation in patients with neck pain (Szeto et al., 2005; Kumar et al., 2007; Johnston et al., 2008; Lindstrøm et al., 2011) as well as delayed offset (relaxation) after activity (Johnston et al., 2008). On the contrary, recent studies show that patients with neck pain display reduced activation of the deep extensor muscles, semispinalis cervicis and multifidus when assessed with muscle functional magnetic resonance imaging (mfMRI) (O’Leary et al., 2011a). So, a good question to ask at this point is how do you know in clinical practice when the semispinalis cervicis is weak and is it weaker in patients with chronic neck pain? The answers to these questions were alluded to in this abstracted study but no testing was performed to measure weakness because the test subjects in this study had no neck pain. Can we make the assumption that weakness is occurring in muscles showing a higher concentration of fat, variable cross-sectional area and higher proportions of type II fibers? I think we can, but is there a clinical test to show it? Not that was shown in this study. With this in mind, it is important that we include appropriate stabilization training that encompasses the complete cervical spine. This is the attempt of the Sensoimotor Control and Rehabilitation of the CT Spine (SenMoCOR) course taught Phil Sizer Jr., PT, PhD, OCS, FAAOMPT with the IAOM-US. The information contained in this article is an effective precursor to the SenMoCOR program. Emphasis in this article is placed on the semispinalis cervicis, a deep cervical postural stabilizing muscle, similar to the multifidus. When used as a neuromuscular re-education (NMR) tool post cervical mobilization, it can be an effective means to keep the newly gained range of motion in addition to activating the appropriate deep cervical extensors that are important in the stability of the cervical spine. This article studied the C2 and C5 levels but I believe that activation of the semispinalis cervicis could be emphasized at all cervical levels, especially as a NMR tool. For activation of the semispinalis cervicis after mobilization, have the patient push gently retract (2-3 lbs. of force) while you are providing resistance at the vertebral arch. A light force of resistance is recommended because as previously mentioned above, in the study by Blouin et al. 2007, multiple muscles can be recruited at lower loads to generate a required force in a desired direction, while at higher loads the primary muscles are predominately recruited. Since resistance applied over the vertebral arch was found to activate the semispinalis cervicis relative to the splenius capitis directly caudal to the site where the resistance was applied, it is important that surface anatomy for the cervical spine be emphasized. The IAOM recommends beginning with the Frankfurter position, which is performed when the dorsal-most part of the occiput is in line with the dorsal-most aspect of the thoracic spine and the lower part of the orbit is in line with the external auditory meatus. C1 is then found between the mastoid and the posterior angle of the mandible, anterior and deep to the sternocleidomastoid muscle. C2 is the first spinous process caudal to the external occipital protuberance, C3 is found at the level of the hyoid bone, C4 at the level of the v-notch of the thyroid cartilage, C5 is found at the 3plates of the thyroid cartilage and C6 is located at the level of the 1st ring of the cricoid cartilage. While not mentioned in this article, a home exercise program could be used to apply these principles for strengthening the semispinalis cervicis. A Mulligan strap or similar strap could be used as pictured below (figures 9 and 10). I recommend an isometric resistance of 2-3 lbs. into extension against the strap for a 3-second hold for a total of 3 sets of 25 repetitions or as symptoms will allow (72 repetitions over a 15 minute period for 7 consecutive days was shown to improve long-term motor learning – Boudreau et al. 2010). All cervical levels can be treated in this manner. You can also implement proprioceptive training using guided imagery with “thinking” looking up and “thinking” looking right or left while maintaining the resistance to add an additional component to the exercises. Blouin JS, Siegmund GP, Carpenter MG, Inglis JT, Neural control of superficial and deep neck muscles in humans. Journal Neurophysiology 2007; 98:920-8. Boudreau SA, Hennings K, Svensson P, Sessle BJ, Arendt-Nielsen L. The effects of training time, sensory loss and pain on human motor learning. Journal of Oral Rehabilitation 2010; 37(9):704-18. Conley MS, Stone MH, Nimmons M, Dudley GA. Resistance training and human cervical muscle recruitment plasticity. Journal of Applied Physiology 1997; 83(6):2105-11. Drake RI, Vogl WA, Mitchell AWM. Gray’s Anatomy. Philadelphia, PA: Churchhill Livingston Elsevier, 2010. Elliott J, Sterling M, Noteboom JT, Darnell R, Galloway G, Jull G. Fatty infiltrate in the cervical extensor muscles is not a feature of chronic, insidious-onset neck pain. Clinical Radiology 2008b; 63(6):681-7. Falla D, Jull G, Hodges PW. Patients with neck pain demonstrate reduced electromyographic activity of the deep cervical flexor muscles during performance of the craniocervical flexion test. Spine 2004; 29:2108-14. Falla D, Jull G, Russell T, Vicenzino B, Hodges P. Effect of neck exercise on sitting posture in patients with chronic neck pain. Physical Therapy 2007a; 87:408-17. Falla D, Lindstrøm R, Rechter L, Farina D. Effect of pain on the modulation in discharge rate of sternocleidomastoid motor units with force direction. Clinical Neurophysiology 2010; 121:744-53. Falla D, O’Leary S, Farina D, Jull G. The change in deep cervical flexor activity after training is associated with the degree of pain reduction in patients with chronic neck pain. Clinical Journal of Pain 2012; 28:628-34. Johnston V, Jull G, Souvlis T, Jimmieson N. Neck movement and muscle activity characteristics in female office workers with neck pain. Spine 2008; 33 (5): 555-63. Jull G, Falla D, Vicenzino B, Hodges PW. The effect of therapeutic exercise on activation of the deep cervical flexor muscles in people with chronic neck pain. Manual Therapy 2009; 14:696-701. Jull G, Sterling M. Falla D, Treleaven J, O’Leary S. Whiplash, headache and neck pain: research-based directions for physical therapies. Edinburgh: Elsevier, Churchhill Livingston; 2008. Kumar S, Narayan Y, Prasad N. Shuaib A, Siddiqui ZA. Cervical electromyogram profile differences between patients of neck pain and control. Spine 2007; 32 (8):E246-53. Leonhard H, Tillmann B, Tondury G, Zilles K. Rauber/Kopsch. Anatomie des Menschen, Lehrbuch und Atlas. In: Tillmann B, editor. Bewegungsapparat, Band I. Stuttgart – New York: Georg Thieme Verlag: 2003. Lindstrøm R, Schomacher J, Farina D, Rechter L, Falla D. Association between neck muscle coactivation, pain, and strength in women with neck pain. Manual Therapy 2011; 16 (1): 80-6. Miller I, Gross A, D’Sylva J, Burnie SI, Goldsmith CH, Graham N, et al. Manual therapy and exercise for neck pain: a systematic review. Manual Therapy 2010; 15:334-54. O’Leary S, Cagnie B, Reeve A, Jull G, Elliott JM. Is there altered activity of the extensor muscles in chronic mechanical neck pain? A functional magnetic resonance imaging study. Archives of Physical Medicine and Rehabilitation 2011; 92(6): 929-34. O’Leary S, Falla D, Jull G. the relationship between superficial muscle activity during the craniocervical flexion test and clinical features in patients with chronic neck pain. Manual Therapy 2011b; 16:452-5. Panjabi MM, White III AA, Keller D, Southwick WO, Friedlaender G. Stability of the cervical spine under tension. Journal of Biomechanics 1978; 11:189-97. Schomacher J, Falla D. Function and structure of the deep cervical extensor muscles in patients with neck pain. Manual Therapy 2013; 18:360-8. Schomacher J, Farina D, Lindstroem R, Falla D. Chronic trauma-induced neck pain impairs the neural control of the deep semispinalis cervicis muscle. Clinical Neurophysiology 2012b; 123:1403-8. Schomacher J, Petzke F, Falla D. Localised resistance selectively activates the semispinalis cervicis muscle in patients with neck pain. Manual Therapy 2012c; 17:544-8. Schuenke M, Schulte E, Schumacher U. Thieme Atlas of Anatomy, General Anatomy and Musculoskeletal System. Stuttgart, Germany: Thieme, 2006. Szeto GPY, Straker LM, O’Sullivan PB. A comparison of symptomatic and asymptomatic office workers performing monotonous keyboard work – 1: neck and shoulder muscle recruitment patterns. Manual Therapy 2005; 10:270-80.